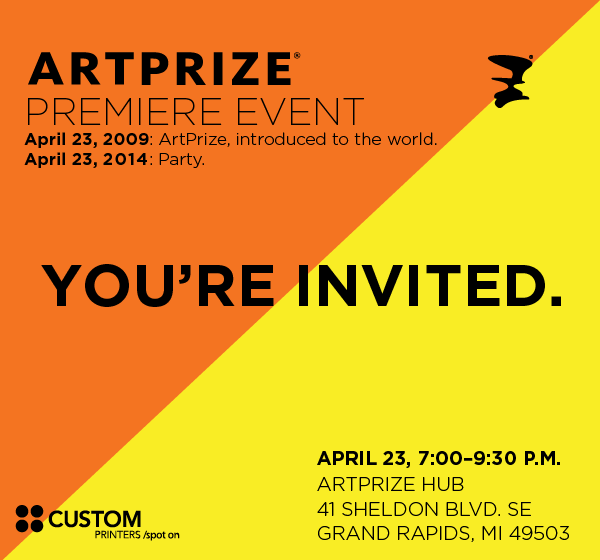 Join us as we celebrate the five year history of ArtPrize at the 2014 Premiere Event. In addition to the unveiling of the 2014 ArtPrize poster, get the first look at a new ArtPrize commemorative book featuring photographs and stories of the first five years of ArtPrize. A special presentation by book contributor and Director of the MCA Denver, Adam Lerner will be followed by music, dancing, singing and refreshments. For one night only, purchases of the ArtPrize commemorative book will include the 2014 ArtPrize Poster and an opportunity to have your copy autographed by photographer Brian Kelly and book contributors Adam Lerner, Dustin Dwyer and ArtPrize Founder Rick DeVos.